Spectacle pattern on a snake's hood. An additional line is seen above the spectacle in this cobra. This is just one of the many different patterns you can find on a cobra. ↑ Naja naja. Itis.gov. Retrieved on 2013-01-03. ↑ 2.0 2.1 Whitaker, Romulus; Captain, Ashok (2004). Snakes of India: The Field Guide. প্ৰকাশক Chennai, India: Draco Books. ISBN 81-901873-0-9. ↑ Reptiles of Pakistan. Wildlifeofpakistan.com. Retrieved on 2013-01-03. ↑ Asiatic Naja. Biology.bangor.ac.uk (2001-10-09). Retrieved on 2013-01-03. ↑ Smith, M.A. (1943). "Serpentes". The Fauna of British India, Ceylon and Burma, Including the Whole of the Indo-Chinese Sub-Region. 3. প্ৰকাশক London, England: Taylor and Francis. 427–436. ↑ Whitaker, Captain, Romulus, Ashok (2004). Snakes of India, The Field Guide. প্ৰকাশক India: Draco Books. পৃষ্ঠা. 372. ISBN 81-901873-0-9. 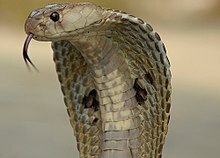 ↑ "IMMEDIATE FIRST AID for bites by Indian or Common Cobra(Naja naja naja)". http://drdavidson.ucsd.edu/Portals/0/snake/Naja2.htm. Serpents in Indian culture An article on Biodiversity of India website.